The wedding industry has been witnessing a steep boom every year. With surmounting hype and attention around weddings, the industry is now worth over billions and billions of dollars. It is needless to point out how the countries in Asia celebrate weddings. Extravagance and over-the-top attention to details are mandatory factors of most weddings around the world. Brides in particular remain especially uptight about customizing their wedding plans with intricate specifications. There are numerous facets to the affair and every one of them is meant to complement each other for a wholesome and perfect ‘wedding’. Let us look at some of the elements that make a wedding an affair to remember. This plays a larger part in Asian weddings. 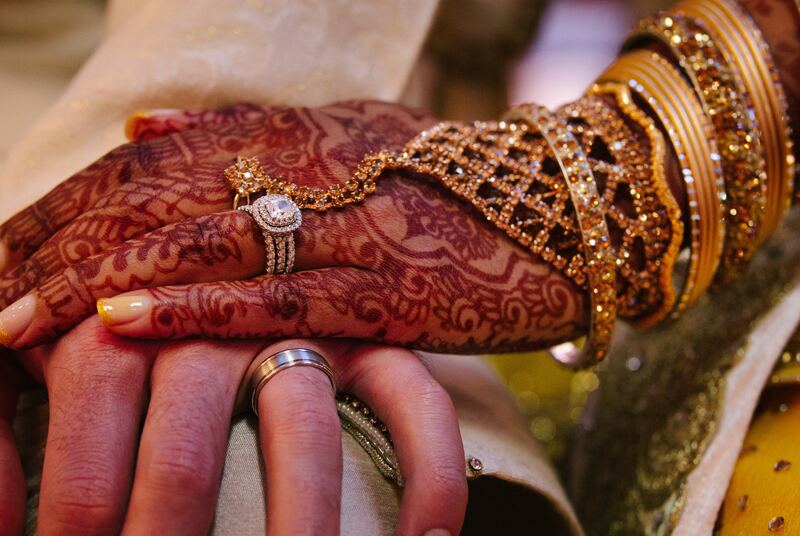 While western countries usually wrap up the formalities of a marriage with a Rehearsal Dinner, Wedding and a Wedding Reception – Asians do not even get started with the celebrations at that point. In fact, the number of events that are considered ‘standard’ increases every year, adding another occasion to rejoice. Consequently, all such events require individual attention and preparation in terms of event management, outfits, jewelry, food and many more. It is no wonder weddings are becoming an increasingly expensive affair around the world. In order to ensure a smooth event for the newlywed couple and the guests, it is crucial that the evening is seamlessly planned out from beforehand. Starting from the venue decorations to every step of the way during the event – it must be planned prior to the event day. These days, weddings do not stick to the conventional itinerary and just have the couple sit on the stage while the guests dine. Weddings today are coordinated with special attractions such as musicals, dance performance, arty entry or exit of the couple and so on. Whatever it takes to make the events more interesting and memorable – the event management team would do it! One of the central focuses of a wedding is the bride. Everybody looks up to how the bride decides to adorn herself with during the events. Every event must showcase a different and meticulously thought-out look for the bride. These days, brides are expected to wear designer outfits during all of their events. Since the designer outfits are so ridiculously expensive for most people out there, replicas are considered to be the next best alternative. It would be wrong to assume the bride takes the entire spotlight during weddings these days. It is now extremely trendy to keep a complementary sync between the couple’s outfits. Grooms are dressed in their best, by color-coordinating with the bride’s outfit as well, so as to project a sense of unity and compatibility. Designer outfits for men are becoming increasingly popular now that men’s fashion has taken leaps towards change and improvement. 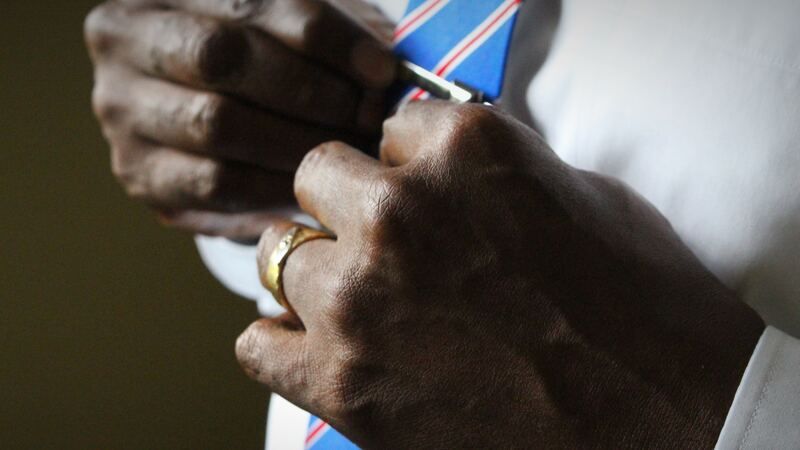 This happens to be the most crucial element of a wedding. Jewelry is not just another element of the wedding to adorn the bride with. It is a symbol that carries a very deep significance. While it completes a bride’s look for her wedding events, it also signifies the blessings of the elders’ that bear with the jewelry. In other terms, the jewelry a bride wears during her wedding is solely hers to keep and save for the future security. It has been the latest fad to document one’s wedding journey in the most creative methods. Couples now pay to get every step of the way documented and filmed in beautiful ways, starting from the Pre-Engagement Photoshoot to the Post-wedding Photoshoot. Photoshoots and cinematography are the latest trend for couples to celebrate and create memories of the grand event. It involves an effort from different creative parties to put together a memorable piece of art for the newlyweds. 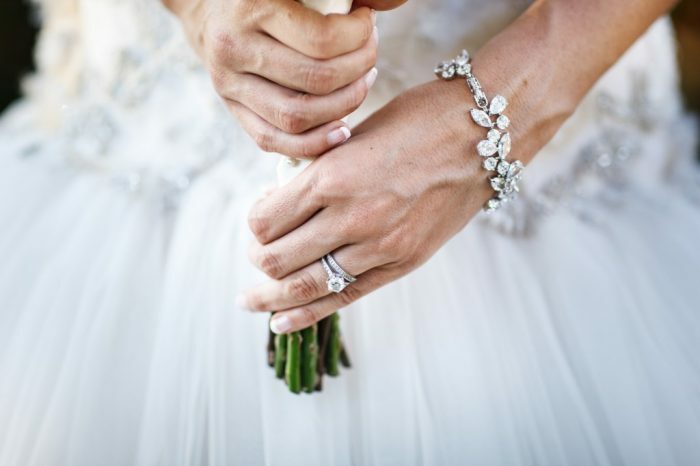 Now that some of the most important aspects of a wedding have been talked about, let us look a little deeper into the most important aspect – Bridal Jewelry. Bridal Jewelry is always a matter of great speculation and attention. Everyone has an opinion about the kind of jewelry the bride chose to wear, or better yet the kind of jewelry the bride was given to wear. Amidst all the drama around the bride’s jewelry, the bride’s focal point remains at one stand – fashion. These days, every girl dreams to be the prettiest bride who makes a statement with her wedding look. The look doesn’t necessarily need to be royally extravagant or cost a fortune – it just needs to be in coherence with the bride’s personal taste and capability. 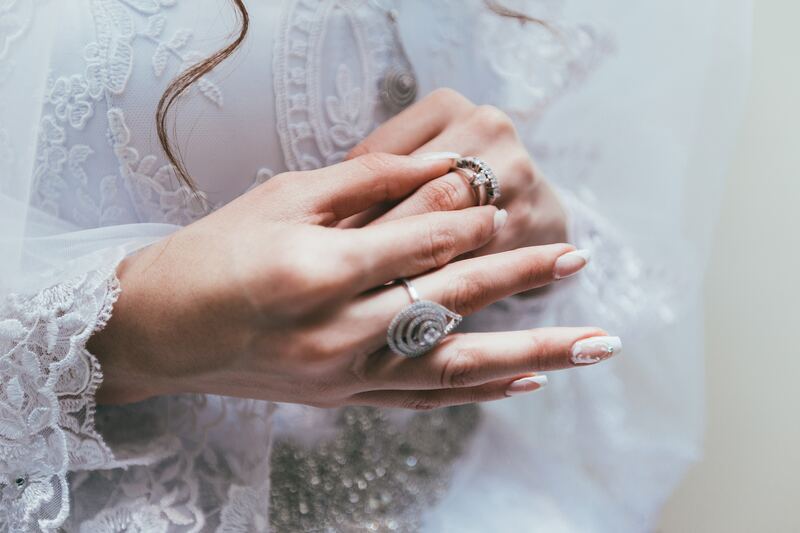 In order to look beautiful in one’s wedding jewelry, there are a few budget-friendly tips that can help budget-concerned brides to not compromise on looking like a treat to the eyes! When the bride decides on her look, it’s important she ensures a good amount of balance in her overall look. The outfit must compliment the jewelry, the jewelry must compliment the accessories and the entire look must complement the makeup. Minimal jewelry can bring about appalling sophistication in the entire look if it is paired with an intricately designed and gorgeous outfit. A dazzling blouse, for instance, should be paired with minimalistic and modern jewelry to not look overwhelmingly out of balance. This will supposedly reduce the cost behind jewelry without compromising the bridal look that would otherwise cost a hand and a leg. 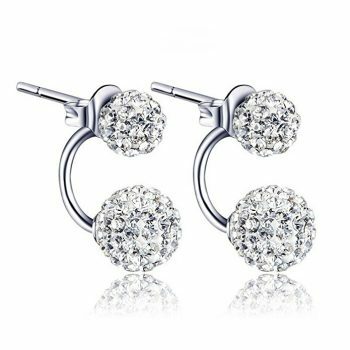 In addition, in accordance to many latest trendy bridal looks, a pair of statement earrings is all a bride needs to go with her gorgeous bridal outfit and look absolutely fabulous. Wearing one’s mother’s wedding jewelry in one’s wedding is a beautiful and sentimental experience. It becomes about inheriting a family treasure and taking it forward. 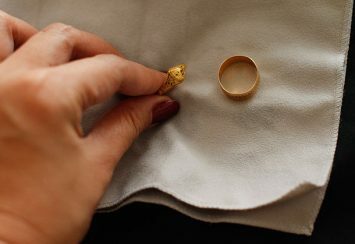 In addition to the beautiful sentiment behind deciding to wear one’s mother’s jewelry, it is also a massive cost-cutter. The entire situation is a win-win situation as the bride gets to honor her mother and carry forward the family heirloom, as well as save a large amount of unnecessary expense. 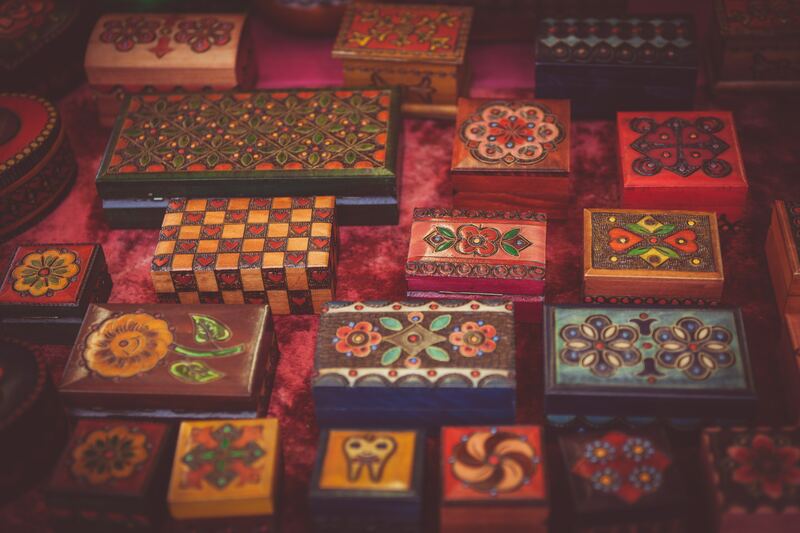 Inheriting family heirlooms may not always be as glamorous as it sounds in the head. When one thinks of family heirlooms, usually an image of an extraordinarily gorgeous, intricate and antique vision appears in our heads. But in reality, the jewelry falls victim to old-age fashion. Whatever jewelry our mothers may have fashioned during their times with grace, just do not fit into the existing trends of today’s jewelry. However, this is no reason to completely dismiss the idea of adorning our mothers’ jewelry pieces during today’s events. Brides can still honor their mothers by wearing their wedding jewelries by modifying them to their taste. Simple additions of gems and stones, or eliminations of unwanted elements can completely change the outlook of a bridal set. It is all about being creative and efficient, which consequently results in being cost-efficient! Replacing expensive diamonds and other gemstones can be an excellent solution to dramatically reduce or cut cost. If done correctly, this will not compromise the bridal set’s exclusivity or beauty. For example, yellow diamonds can easily be replaced by yellow sapphires to create the same effect; smoky quartz can replace brown or champagne-colored diamonds. In addition, zircons and different kind of other gemstones can now easily replace the more expensive ones to reduce the cost of the entire bridal set. Colored gemstones can be used in multiple ways to complement the bright outfits that brides go for now. Not only will they make a statement with the colors, but it will also be a budget-friendly and trendy option. In addition, natural untreated gemstones can be a lot more expensive than the treated and synthetic ones. To everyone’s benefit, oftentimes the synthetic gemstones look more attractive than the uncut and untreated ones. This result in better shine and less money! It is important to incise the jewelry budget for the wedding carefully and be certain of not exceeding it. It must be within the bride’s capability. However it is important to remember that a girl’s wedding jewelry is more of an investment than an unnecessary splurge. The best kind of material to invest in that would also ensure a profitable resale value is gold. However, there are several qualities of gold that vary in quality and pricing. If one wants to decrease the cost of gold jewelry, an option is to not go for 22K or 24K. They hold the highest price point in the market. Instead of these categories, other options include 18K or 14K jewelry pieces that would significantly reduce the cost of the entire bridal set. Gold is not necessarily the only option when it comes to bridal-wear. It may appear to be the best option, in terms of investment for the future. However, there are cheaper alternatives in the market if the bride’s priorities lie elsewhere. For example, silver or artificial jewelry are other options that a bride can choose over gold, if budget is a factor. Expensive elements can also be substituted to reduce cost. Diamonds can be replaced with pearls to create a similarly exotic effect, but with a lower cost. Brides do not only go for conventional pieces during their weddings. 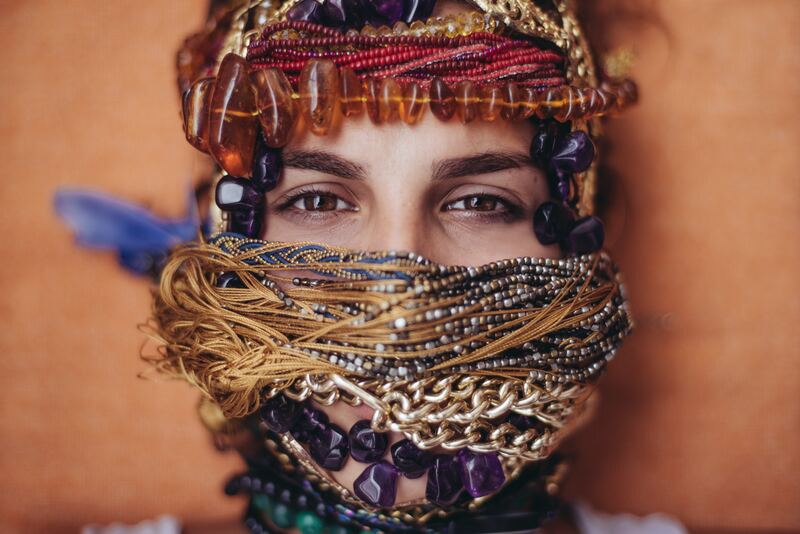 Oftentimes, they tend to go overboard with extra pieces of jewelry such as headpieces, nose rings, hair accessories, bangles etc. Since these are articles that are not likely to be used ever again, many do not find it reasonable to get them in gold. These pieces are either artificial jewelry or at best gold-plated to give a similar gold-like effect. Brides can choose to wear an overall gold-plated bridal set and set an equally trendy impression on her wedding day on a low-budget. It may be the most efficient way to make the most out of the money spent on jewelry. Oftentimes, brides tend to go for a royally extravagant look as inspired by editorials. However, those bridal sets are not usually appropriate to wear on any other day. So, very little use comes out of such a huge amount of money. Therefore, some brides these days are becoming increasingly aware of the wasted gold and opting for more modern, contemporary and versatile designs. They are fashioning their bridal sets with a minimalistic and modern design that can be worn on multiple occasions later on in life. This makes the investment behind the jewelry less wasteful and more useful. Every jewelry piece comes in a variety of quality standards. A bride may go for an otherwise expensive set of jewelry in a much lower price by opting for lower quality elements. If diamonds are the preferred gemstone for a bride, looking for a more budget-friendly way out – there is a range of selection for diamond clarity. It is not necessary for the bride to blindly go for excellent cut diamonds. The expensive and top-end option of D-E color ranges, brides may opt for more economical yet equally exquisite color grades such as G-H. Instead of unknowingly going for the most expensive diamond cuts, leaning towards clarity grades such as SI (Slightly Included/Small Inclusions) may prove to be a major money-saver. There are brides who completely dismiss the idea of spending a fortune on jewelry that they would never again get to use. Brides as such think of the investment as a total waste of money and would rather put the amount elsewhere in their lives. However, according to custom, brides are expected to be well-adorned in beautiful jewels. In order to not waste that sum of money on actually buying the jewelry, some brides tend to rent out second-hand bridal sets just for their big day. It has actually turned into a business among numerous localities where bridal sets are rented out just for the day. This is a huge money-saver for brides who are not at all interested in investing on jewelry. Now that we have spoken about some of the ways in which the wedding budget can be crunched down lower, we can talk about all the types of brides who would opt for each of these ways. Surely, we all have an image of how a bride should be on her wedding day. Yet, there’s always a little girl with very strong and decisive opinions hides behind every bride. They all prefer things to be done differently. The individual bridal choices build up to make a completely unique wedding ceremony. It may differ in terms of the wedding theme, the event planning, the event decorations and most importantly the groom and bridal outfits. Brides tend to be extremely specific about how they want to look on their wedding day. There are a lot of factors that build up to this decision. For instance, some brides are greatly influenced by the culture they have been brought up in and that clearly reflects in the way they adorn themselves up on their big day. Some brides tend to follow the trend and look as contemporary and glamorous as the brides on the editorials. There are brides who signify their family more than the ongoing trends and mirror the look their mother wore on their wedding day. As per the latest trends, some couples go for a completely thematic wedding and design their outfits based on that particular theme. All the weddings in the world, no matter which kind it falls under requires the bride to wear jewelries that compliment the entire ceremony. How can the brides look their best without busting their wallets? Well some ways have been discussed above. If further ways must be speculated out, in regard to different types of brides, maybe we should just keep reading. Wedding accessories and jewelry largely depend on the kind of dress the bride has chosen to wear. Starting from the color of the gown to the neckline, everything has to compliment the jewelry the bride decides to pair with her look. However, it is crucial the bride does the let her outfit and jewelry overwhelm her. None of what she is wearing must outshine the bride herself. Since the dress is what a bride customizes to her heart’s will, the jewelry is oftentimes confined to tasteful minimalism. Even though there is no rulebook to fashion, there are certain guidelines that may help a bride to look her best in the most cost-effective manner. Money-saving tips and tricks have been discussed beforehand. Now let’s talk a little more about the kind of jewelry every type of bride is not likely to go wrong with. A bride’s style can be greatly determined by her choice of wedding gowns. The Ball Gown wedding dress is a classic ‘fairy tale’ fitted bodice wedding gown. The full flamboyant skirt make it an ideal shape for most body types. The A-line Wedding Gown is quite similar to the Ball Gown wedding dress, differing from the flairs on the skirt. It rather creates a straight A-shape all throughout the body. This is also a universal cut that is flattering on all body shapes. There is a slight modification of A-line Wedding Gowns known as the Modified A-line. It remains bodice fitted while flaring around the hips. The skirts in these dresses are more tightily fitted than a regular A-shaped gown. Another type of wedding gown is the Trumpet. It is fitted all throughout the bodice and flairs at the middle of the tigh. This greatly accentuates the stomach and hip region, which makes it an ideal choice for petite women with an hourglass figure. Very close to the Trumpets are the Mermaid cuts of wedding gowns. They are also fitted throughout the bodice, hips, and flares closer to the knees. They are well-suited for petite frames with gorgeous curves. Now let’s talk about the Sheaths. They flow straight from hem to neckline, which gives off a flattering impression for girls with petite frames or hourglass frames. They must be put on with more care as pear-shaped body cuts may look quite unflattering in these dresses. There are more informal gown cuts such as the Tea-Length Wedding dresses. They are perfect for all body types as the skirt reaches somewhere in between the knee and the ankle. Lastly, there are Minis, where the skirt hem falls over the knee. They are also suitable for petite body structures, as the cut would make plus-sizes look unflattering. Given all the types of wedding gowns, the kind the jewelry they can get paired with depending solely on the color of the wedding gowns and the necklines. The necklines determine whether the gown needs anything overwhelming to complete the look. Similarly, the neckline also determines if the bride should tone down her entire look with minimal jewelry so as it does not outshine her. 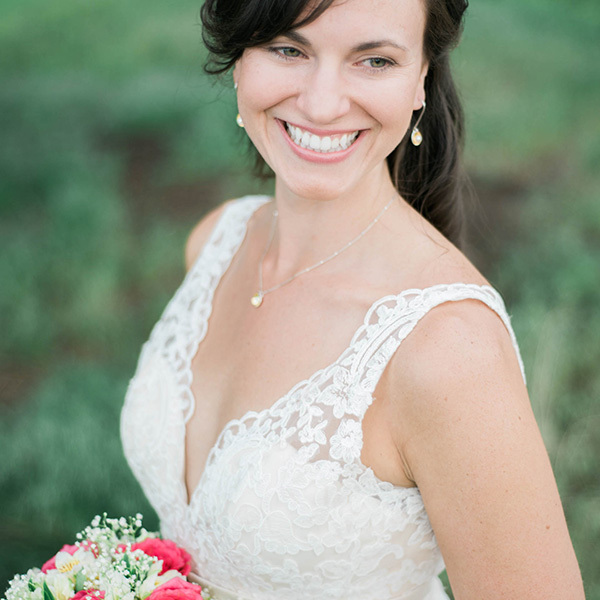 There are several types of necklines that brides opt for. Different necklines are more suited for different types of brides. A lot of factors play a part in determining the kind of neckline that would be appropriate not only with the wedding gown cut but also of the bride’s body type. There are all kinds of brides out there who seek a specific kind of jewelry to complete their bridal look on their big day. 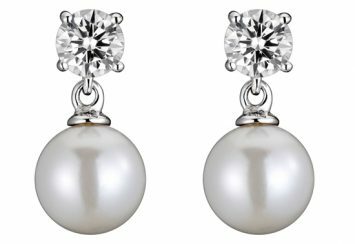 Whether they are the traditional brides, contemporary brides or even a bohemian bride, they all look for some bling in their diamonds and pearls to upstage their look with the ultimate panache. It may be assumed that attractive jewelry costs a lot of money, however, that is not always the case. 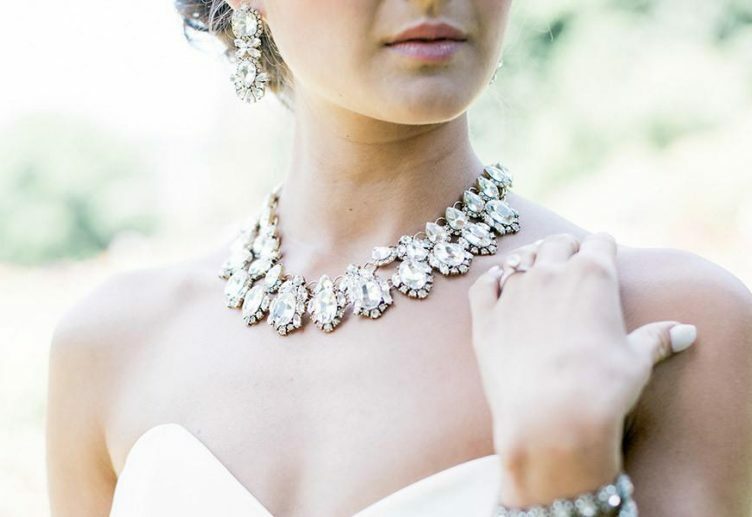 Tasteful jewels that can elevate a bride’s look can easily be found without breaking your banks. White Gowns: White gowns are the cult classics. The color white accentuates purity and has a cool undertone that only goes with platinum or silver hues. The jewelry paired with white bridal gowns should be silver, platinum or crystal-based. Ivory Gowns: Ivory is slightly more creamy than white gowns. Therefore, instead of pairing them with silver or platinum hues, they would be further enhanced by golden hues. Thus, gold is a magnificent choice of metal for ivory brides. Champagne Gowns: Champagne is also more on the creamy side of the color palette. Therefore, ideally gold should work nicely with a champagne colored wedding dress. The warm tones of this shiny light-beige color may also compliment antique-y jewels. Burnished silver with rhinestones may be a creative way to go with champagne wedding gowns. Blush Gowns: Blush gowns will have an obvious pink cast on the overall look. In order to further enhance the beautiful blush of the bride’s gown, rose gold may serve as the best option. It will coordinate with the soft pink cast of the dress in the most amazing way. Select substantial metals that do not appear too fake from the intended impression. For example, if the bride opts to wear gold jewelry, she must make sure it does not appear too yellow to catch unwanted attention. In case of gemstones, crystals and CZs, it must be carefully scrutinized that they are meticulously set. Haphazard assembly of these elements would completely destroy the look for the bride. The best bet is to go for sleek and subtle designs that are more on the simple side. Over-the-top embellishments will only bring about more attention towards the jewelry rather than the overall elegant bridal look. 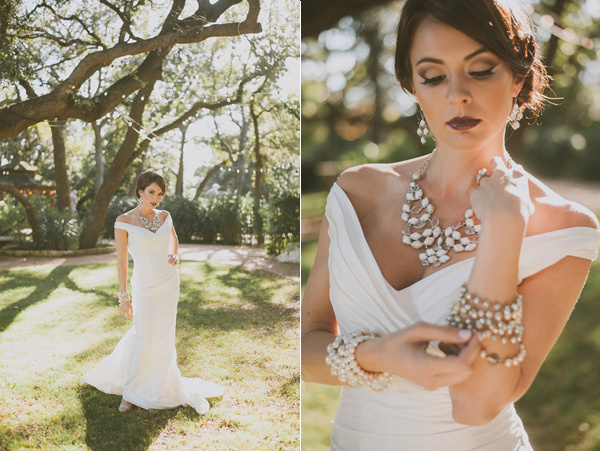 Let’s look a little further into what neckline enhances the beauty of the kind of jewelry a bride could wear. Boat Necks are very popular among brides now as it beautifully accentuates the bride’s neck and shoulders. They are a popular choice in most kinds of wedding gown cuts. It beautifully follows the natural curve of the collarbone, which can be very flattering given the right body structure. Jewelries must be kept extremely elegant and simple. If the bride chooses to wear a necklace with a boat-neck wedding gown, it must be kept of a very short length. However, it would seem more elegant to completely forego the idea of a necklace and stick to mid-length earrings and a matching bracelet. 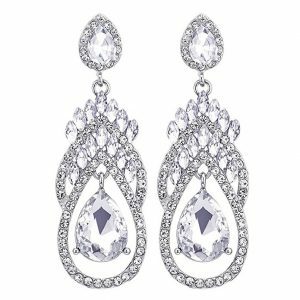 Budget-friendly ball-drop ear jackets or teardrop earrings are excellent options to carry the look off. Such options can be readily found in stores like Amazon. 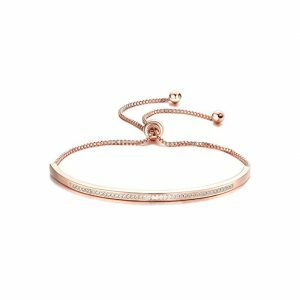 Beautiful bracelets can be found within $100 at Amazon for the perfect pairing with the chosen earrings. Another way to reduce cost is to alter diamond bracelets for pearl bracelets – equally elegant but much less expensive! This is the most versatile wedding dress shape that brides can sport about anything with! Starting from bold, multi-strand necklaces, bejeweled bibs and even classic pearls go wonderfully with strapless gowns. Brides can play around with their own personal styles and accessorize this gown any way they want without any major rules. There is just one balance they must abide by – necklace and earrings must balance each other in terms of boldness. Strapless gowns play the safest bet with statement necklaces and small bud earrings. Affordable statement necklaces are not so hard to find. For instance, this oversized gem-necklace is available at Amazon! 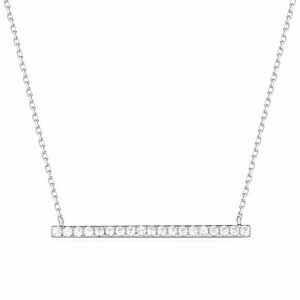 A rule of thumb restricts the necklace to outshine the plunging neckline. 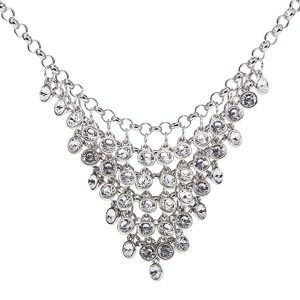 However, if the bride really opts for an ultra-glamorous look, she can go for an all crystal neckpiece to go with the deep plunge of the neckline. Otherwise, it is safe to stick to a simple pendant or a pearl necklace. If the bride prefers to not take the spotlight of the beautiful V-neckline, she can simply accessorize with a simple pair of earrings and a bracelet. 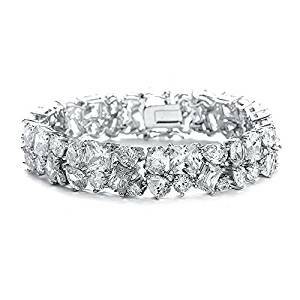 If the bride opts for golden jewelry, as opposed to silver, she can find Gold Chained Bracelets with faux diamonds for an affordable yet gorgeous look. For a one-shoulder dress, the bride must carefully balance her entire look. It all depends on the extent to which the dress itself is decorated. If the bridal gown is plain and simple, the bride may go for an entire bridal set with a neckpiece and earring. A plain simple dress calls for statement accessorizing. However, if the dress itself contains a good amount of detailing and work, the bride wants to keep the necklace and earring to a subtle standard. Appropriately, light-catching earrings that look beautiful from the back too must be paired with over-sized cuffs. When it comes to a One-Shoulder Gown, it is essential the bride sports the cuffs on the bare hand. Crystal layered earrings are a great option to not overdo the look or outshine the dress itself. Brides that go for a Spaghetti Strap Wedding Gown, often end up with a heavily embellished gown itself. Majority of such gowns have intricate beading and embellishments all over, that eliminates the need for heavy accessorizing. Brides, therefore, focus on earring and a bracelet to go with their gorgeous gowns. On the other hand, if the gown does not have any beading on the bodice, the bride may consider wearing a necklace of a triangular shape. There are many more stores that offer beautiful pieces of such jewelry at an affordable price. The bride must keep the metal, crystal quality and such factors in mind to shop for affordable jewelry. Halter necklines are not very common but definitely exquisite! The neckline tends to attract most of the attention of the dress. 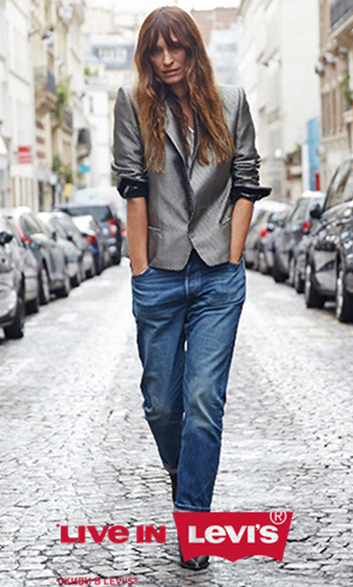 This negates the need to wear a necklace as that would only increase clutter on the entire look. Brides can go for mid-length earrings or quiet hoops along with a matching pair of bracelets. 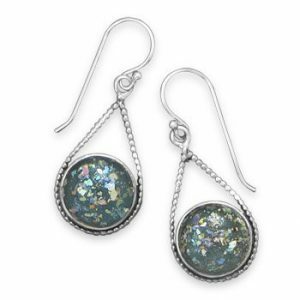 In addition, Glass Stone earrings is an absolutely amazing head-turner. Halter brides tend to keep the jewels at the minimum and therefore, get a splendid opportunity to accessorize their hair. A little headpiece adds a lot of shine and glamor to the entire look. Weddings are the most important days in a girl’s life. The perfection every girl anticipates and thrives for in unparalleled. This does not mean the girl has to spend recklessly to achieve the wedding look of her dreams. It must be planned and executed carefully so that neither unnecessary money nor the elegance of the event gets compromised within the process. There are several options, both online and offline that offer beautiful bridal jewelry at really affordable prices. They might not be of the best quality, but the brides must exercise utmost sincerity and wit while purchasing them. Some such tips have already been discussed above.